Drive Permissions Auditor is a great new add-on from Labnol (Digital Inspiration). 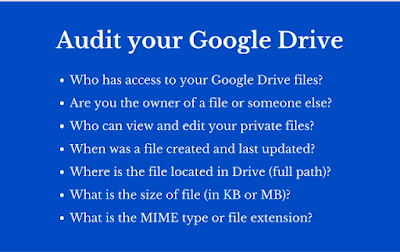 As its name indicates, this add-on allows you to generate detailed access and permission reports of your Google Drive files. The Auditor performs an entire scan of your Drive’s files and folders and provides you with data on who has access to which files and what level of permissions they have. While this add-on is free but it only scans access permissions of up to 200 files in your Google Drive, for auditing more files you will have to switch to the premium account. 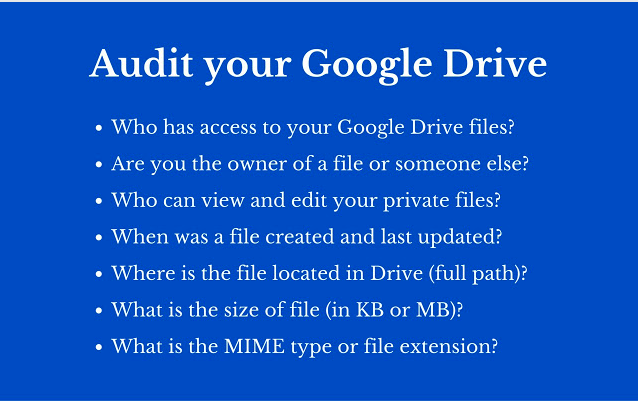 Besides knowing who has shared access to your Drive file, The Auditor reports include other important information about your Drive files such as their size, list of Google Accounts that have access to your files, the entire path of files in your Drive, and the access type others have on your files. 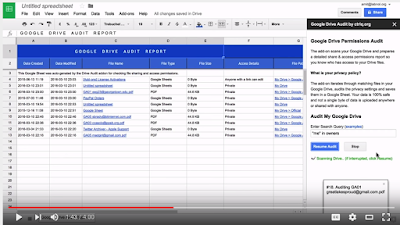 ‘The Drive Auditor add-on is an essential security add-on for Google Drive as it will help you know if any important files and documents have been inadvertently shared outside your Google account or your Google Apps domain.’ Watch the video below to learn more about what you can do with The Drive Auditor.